Diameters 0.225 Mts. to 4.0 Mts. Length 3.0 Mts. mm to 11 Mts. Flow rates Up to 400M3/Hr. Dual Media Filter is used for removal of suspended solids, turbidity and some part of colour and odour from Water & Wastewater.. We, at BIOTIC WATER offer Series of filters at a low cost, reliable and highly efficient way to filter your water. 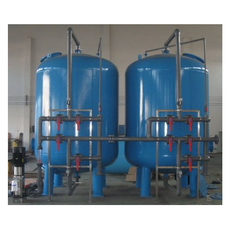 Our unique design of Dual Media filter ensures the maximum utilization of the surface area, lesser pressure drop across the filter bed and effective removal of the impurities even under the conditions of high filtration rate compare to pressure sand filter. Raw water is passed through the dualmedia filter, contain anthracite along with fine sand reinforced by marbled and gravels. These filters consist of a coating of anthracite (1.25-2.5mm) resting on a coating of fine sand (0.6-1.5mm) Anthracite is coarse and has more dirt holding capacity as compared to fine sand. During the filtration cycle the largest particles are strained out by the anthracite then the sand traps the rest of the particulate matter though a combination of adhesion and straining. Since the particles in the water are filtered out at various depths in a dual media filter, the filter does not clog as quickly as all of the particles were caught by the top layer. 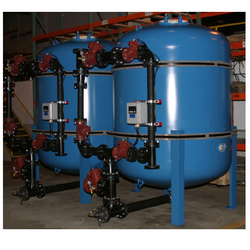 Pressure Sand Filter is used for removal of suspended solids & turbidity from Water & Wastewater. We, at BIOTIC WATER offer Series of filters at a low cost, reliable and efficientway to filter your water.